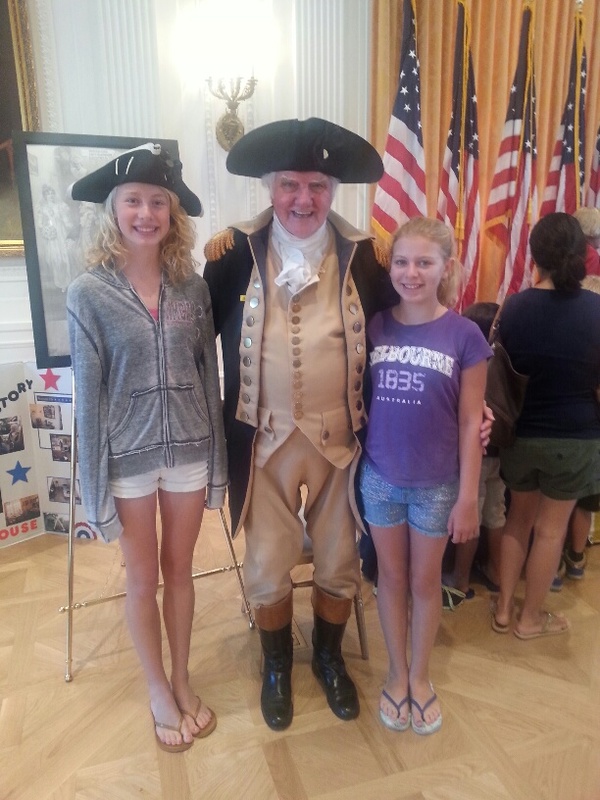 Having lived in Yorba Linda all their lives, my two girls have been to the Nixon Library many times. In addition to the presidential exhibits, there are always wonderful community events hosted on the grounds including book signings, guest lectures, and the annual Orange County Girl Scout birthday celebration we attend every March. It is a beautiful place to visit, which made its newest summer community event, “Meet the Presidents” a must do. 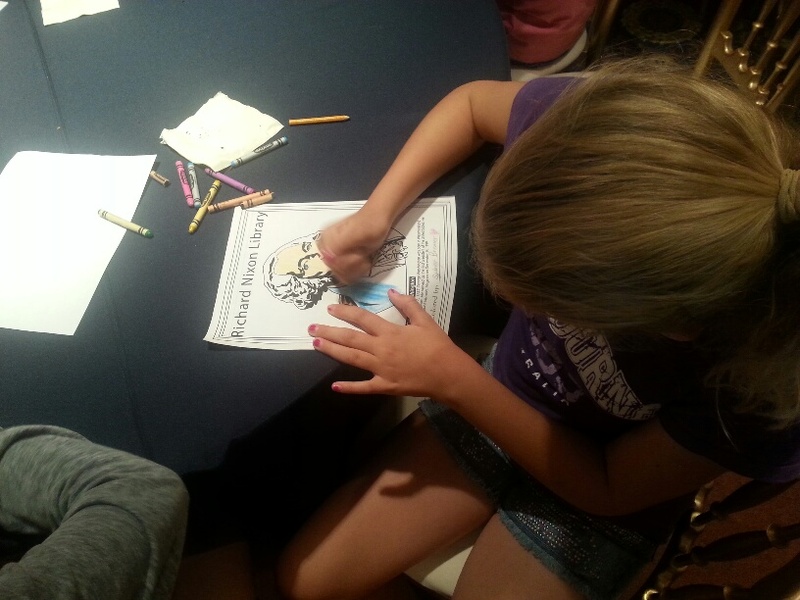 On five Tuesdays this summer kids and adults alike can come to the Nixon Library free of charge for this educational event. Running from 10:30 to 11:30 or so, kids can color, eat fresh-baked cookies and sip lemonade, and ask questions of the “presidents” after their lecture. There are also photo opportunities after the Q&A. 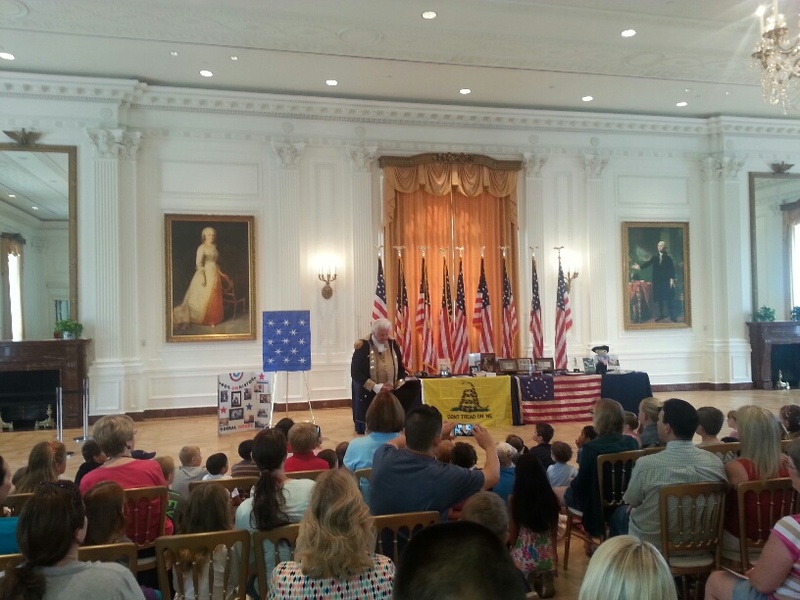 We were privileged to attend the first event and hear from George Washington. It was timely and interesting, given that our family had just returned from a vacation to Colonial Williamsburg and Washington DC. And as middle schoolers, they are up on their colonial history. Many toddlers and young children were in attendance and no doubt they found the meet and greet fascinating. 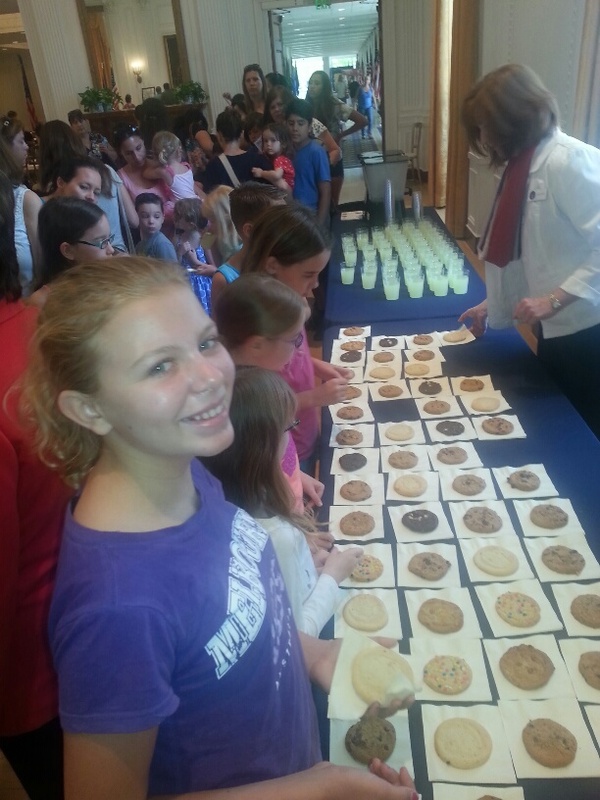 However, my older girls and the adults of all ages in attendance gained even more knowledge. 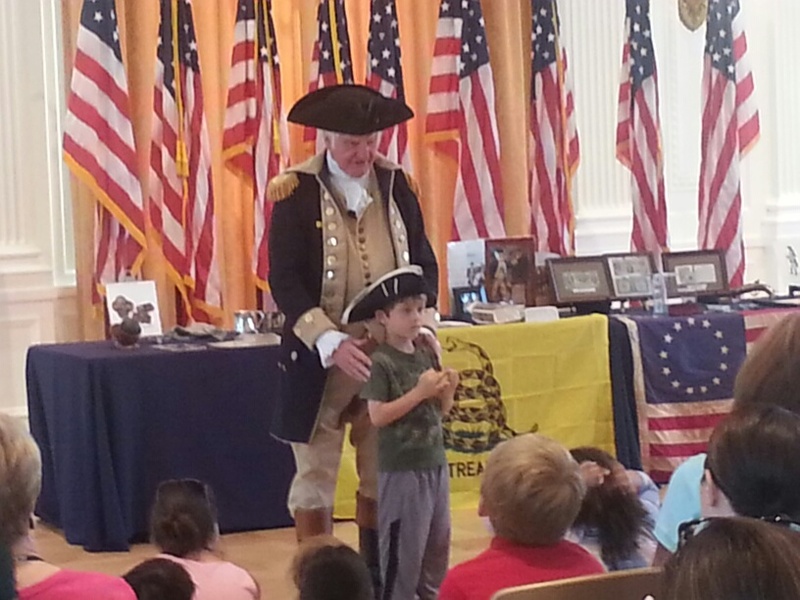 “George Washington” was dressed in full uniform, was full of anecdotes, and truly engaged the audience with a kid centric Q&A. While we surely know our basic facts about Washington (first president, Mount Vernon home, commander of the Continental Army, first to sign the Constitution), meeting him “in person” offered other interesting details. I asked my girls what other trivia they found notable and they shared these highlights. While Washington and wife Martha did not have children of their own, she had two from a previous marriage. The Washington’s also helped raise nieces, nephews, and grandchildren. A great-grandchild was born at Mount Vernon just before his death. And Washington attended one of these surrogate daughter’s weddings at Mount Vernon in his full military uniform a few days before he died. Also, while his wooden teeth are well-known, he actually had just one tooth to hold in the rest of his wooden teeth (a lot of dental problems there). And lastly, Washington was adamant that he did not want his image on currency during his lifetime. It was later that he was honored with a place on our quarter and dollar. Anyone can read names and dates in a history book. But bringing history to life-like this makes it really stick with kids. My girls are big history lovers due in no small part to travel and interesting activities like “Meet the Presidents” right in their own backyard. There are many more opportunities to meet several other presidents and a first lady and infuse a little history into your youngsters this summer. Mark your calendar for these meet and greets in the White House East Room. MEET PRESIDENT ABRAHAM LINCOLN – TUESDAY, JULY 15 Hear about Honest Abe’s humble beginnings, how he went on to become the 16th President and lead the nation through the Civil War. Meet the exuberant and charismatic 26th President of the United States. Portrayed by his younger brother, Ed Nixon. Learn about his childhood in Orange County and his achievements as the 37th President in bringing peace to the world and a more just society at home. Maureen Drown Nunn brings her dazzling portrayal of First Lady Pat Nixon back to the East Room. She’ll speak about Mrs. Nixon’s humble beginnings, and how she worked her way through college to become one of the most beloved figures in modern American history.